Portable Coasters for Naturally Chilled Refreshments Store this granite coaster set in your freezer and carry the caddy to your celebration for a naturally chilled round of beer or soda. 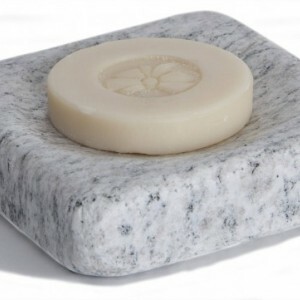 Handmade from reclaimed granite, the substantial anti-tip coasters employ the chillable quality of stone to keep your beverage cans cold and securely upright. Each coaster is a different variety of granite, so sippers can easily identify their cans. When you lift your drink, the robust coaster will stay where it belongs instead of sticking to the can, and the foam bottoms prevent scratches. The hardwood and aluminum caddy keeps the coasters securely housed and the sea stone handle makes the entire set easy to tote. For chilling 12 oz. glass beer or soda bottles, see our Beer Chilling Coaster Set.